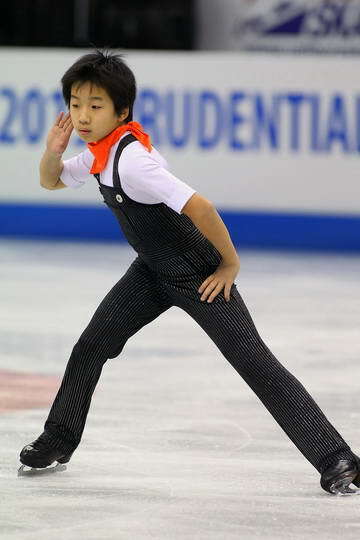 Tomoki Hiwatashi (born January 20, 2000 in Englewood, NJ) is an American figure skater. He is the 2016 World Junior bronze medalist and the 2016 U.S. national junior champion. He qualified fourth for the 2018-19 Junior Grand Prix Final. Perdita told us about Tomoki's father's blog about Tomoki's skating life until he won the juvenile Nationals in 2010. It's all in Japanese but you can see a lot of cute photos of young Tomoki and the dedication of his family to his skating career is very heart-warming. Tomoki was injured at 2013 JGP Mexico and did not compete for the rest of the season. Feb. 2015 -Donlan, Bartholomay crush pairs field in The Hague Hiwatashi wins Junior Men's. Jan. 2016 - The Japan Times -Figure Skating | ICE TIME "Hiwatashi continues to build on outstanding record," by Jack Gallagher. Jan. 2016 - Nathan Chen to miss worlds after injuring hip in exhibition. Hiwatashi is given his Jr. Worlds assignment. Last edited by dorispulaski; 03-08-2019 at 04:25 PM. Tomoki is a fearless competitor. I will not forget the first time I saw him skate, at 2013 US Nationals in Novices. He was just charming as a tiny train engineer, skating to "Orange Blossom Special." His step sequence was particularly great, quick-footed and joyous. Last edited by dorispulaski; 03-20-2016 at 01:54 AM. ... Hiwatashi has some big goals he is working toward for this upcoming competition. “My goal would probably be to get the highest score possible and get on the podium this year,” Hiwatashi said. He is also hopeful he can include two triple axels in his long program and one triple axel in his short program. Hiwatashi also wants to try some quad jumps while practicing in Hungary. Congratulations to Tomoki for meeting his goal of making the podium at Junior Worlds . And thanks to Doris for the thread. I'm pretty sure the first time i saw him skate was 2015 Nats, where he got 5th. He didn't make it to the podium but he is the one skater I clearly remember from that event. I saw so much potential in him and I was really hoping he would have success in the future. So I'm completely thrilled to see him get the bronze at Jr. Worlds. A well deserved medal for a very promising young talent! goldenicecoverage411, thanks for the info!. I have added it to the OP. Sorry if it's mentioned already, but his father used to run a blog about Tomoki's skating life until he won the juvenile Nationals in 2010. I came to know this blog 2 or 3 years ago after it had stopped, but it's really thrilling to think how far he has come! congratulations to Tomoki!! he was great and only 2A away from silver medal improvement he made since start of the season is amazing, cant wait to see more of him! Sure would love to see Tomoki skate at the Skate America gala in Oct. at the Sears Center! Tomoki came in second in junior men at the 2016 Broadmoor Open where he debuted his new programs. I guess it's official: Tomoki has joined Team KoRo! Tomoki is training at 7k with Kori Ade and Rohene Ward. Marina Zueva is doing his choreo though. Awww - very happy for Tomoki but sorry he will leave Coach Ouriashev. I thought he seemed to be progressing so well. Maybe he now needs a challenging environment with top skaters. Best of luck to Tomoki. Very proud of you. Please skate at the SA gala! Just wanted to mention how much I loved Tomoki's Short and Long programs from Riga JGP recently. Congratulations on winning the Bronze medal!! ^^^Still cheering for my local guy, Tomoki! So happy to see he won the bronze! Very happy to see this thread revived. ^^^Tomoki is so talented! So sorry he left the Chicago area, but he seems to be thriving in his new training environment. I think he has a bright future. Tomoki did a lovely 4T-3T in his FS at Midwestern Sectionals and scored a whopping 16.35 points for it! He won the FS! He had problems in the SP, which is why he lost overall. It's worth checking out on IN if you have a subscription. I was thrilled to see how well Tomoki did in the long (although I will admit, as a program, I like the short better). Hopefully someday it will be freed from IN for a wider audience. Congratulations to Tomoki on his Nats performances. He got off to a tough start in the short, but he came back in the FS and really won the crowd over! Under rotation on his opening 4T- 3T, popped the 3A. After that, awesome skate with a cheering crowd behind him. He may be small, but he's a little firecracker! Can't wait to see how he develops in the future.